If you follow us on a regular basis, you know that we are huge fans of PrideBites. 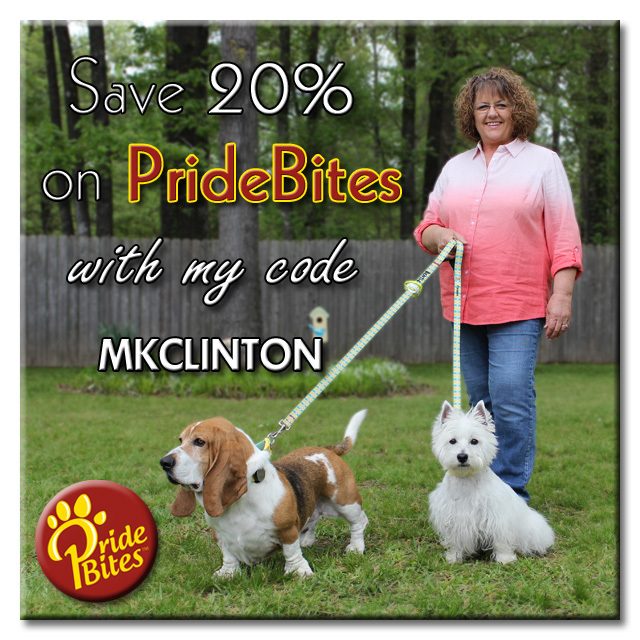 They have been our go-to company for everything from toys to collars for several years. I believe in their products so much that I am a proud PrideBites PAWtner. One of the advantages I get is testing out and reviewing some of their newest products. 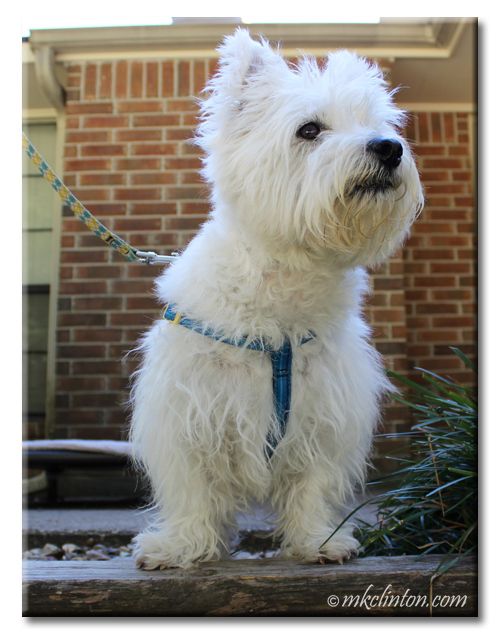 They recently introduced their Step-In harness so we ordered one for Pierre. 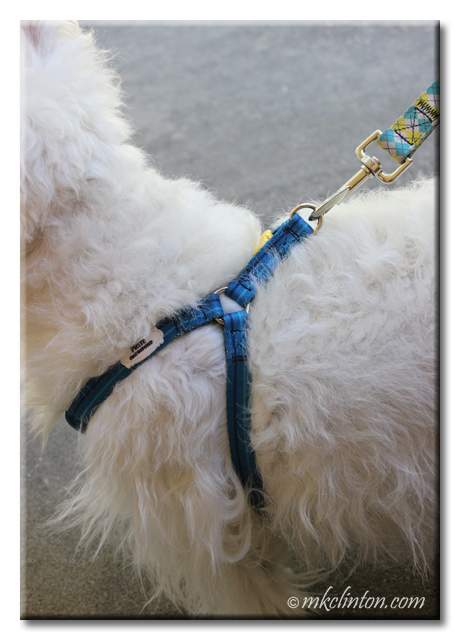 He has to wear a harness anytime he is on a leash because he is a puller. This causes him to do an over-dramatic gagging exhibition so people think we are choking him. 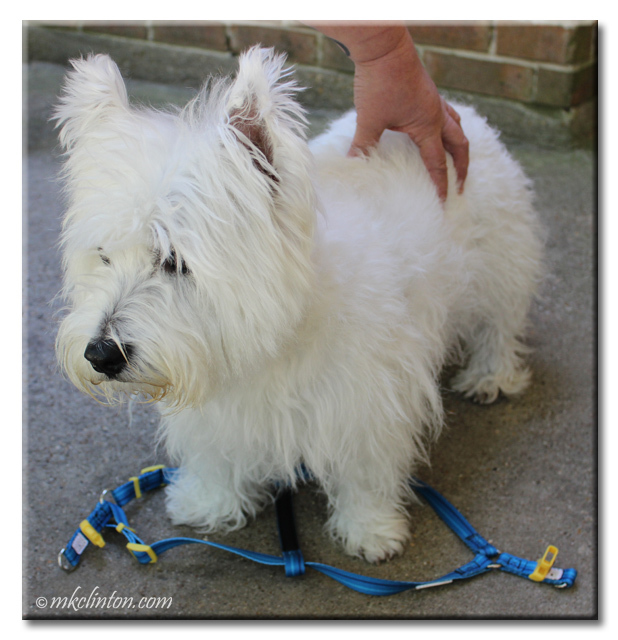 We have tried an assortment of harnesses through the years for both dogs. They are difficult to fit so I am always skeptical about sizing them correctly. PrideBites took that fear away with its simple measurements for the Step-In Harness. Once you get the size, the next few fun steps take you through the design, personalization, and order. You can choose from a variety of styles, colors, and name designs. 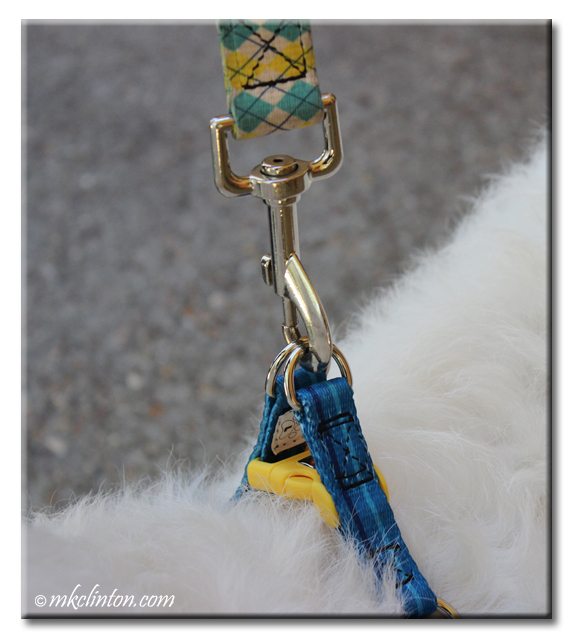 For Pierre, I ordered a small with a yellow buckle and a teal stripped ribbon. It color-coordinates with one of his PrideBites leashes. I selected the BigDog font for his name and our phone number. When it arrived, it took me a few minutes to figure out how to put the harness on Pierre. I have never used a step-in type before but let me tell you, I LOVE IT!! The fit is perfect for Pierre and it will not choke him. He seems much more comfortable than in his regular mesh harness. Getting into the harness is simple. The cushioned strap goes down the middle and they “step-in” either side. Connecting the sturdy fastener on Pierre’s back is so easy! 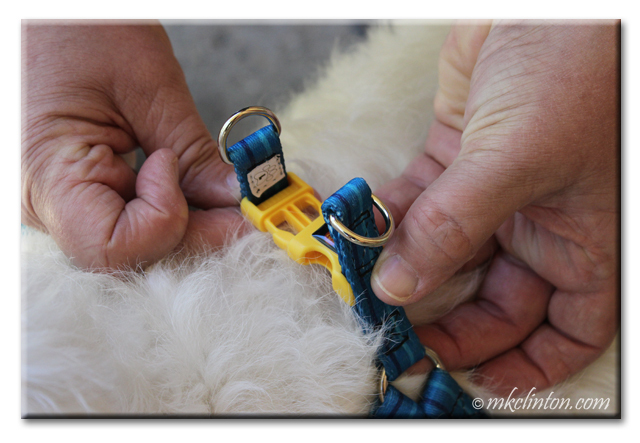 Double loops for added security make attaching the leash a snap. The center strap is gentle on his chest and won’t cause choking. The sides are adjustable for a perfect fit. Didn’t his name tag turn out cute? This is our new favorite harness. I'm excited to order one for Bentley too. It is really pawsome! A perfect fit too. What a cool harness and I love that it's personalized! My harness goes over my head rather than me stepping into it. The one we used to use fit over Pierre's head bit he could still manage to choke himself. This one eliminates that problem. You've got your brother in a harness now, Bentley, time to order the cart so he can pull you around town! That is a great idea! Get ready to mush, Pierre! That's a clever design harness. Maybe once ghostwriters knee heals up we'll start going for walkies again. We are hoping her knee heals quickly and she can be out of pain. The harness is just what we have been looking for. With Huskies, I'm a huge fan of harnesses, and I really like that these have that added security! Thanks for a (p)awesome review! This is a great harness and they make them in Husky size too! This is the best harness EVER! We have about four or five and this one fits like a glove. That is a super harness and leash. We have some that work the same way... and we LOVE them. Easy EASY to get into and out of... and Comfortable. 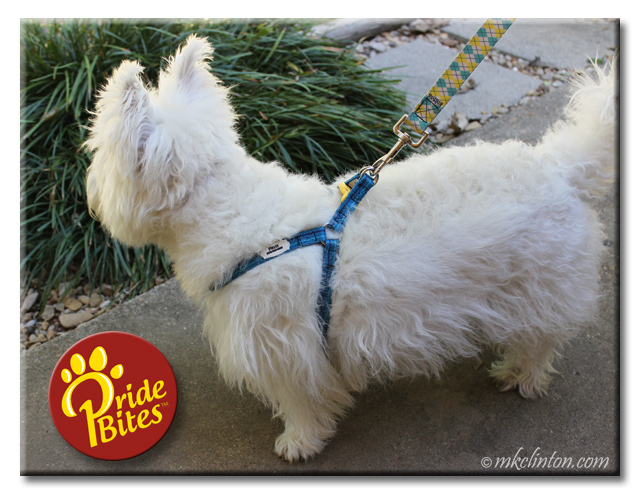 They are so easy to put on even with an excited hyper Westie! BOL! BOL! It is purr-fect! Have a great weekend! Easy-peasy AND good looking. What's not to love about this harness? It is by far my absolute favorite for Pierre. I am going to order one for Bentley too. This one is easy and does not get under Pierre's neck. We have to be very careful of that since he chokes so easily. That looks like a really nice harness. Now Bentley can walk in style. Pierre thinks it is so much easier to walk in his so I know Bentley will love his too. We used to use step in harnesses and mom thought it was amazing how quickly we learned to actually step in them! Pierre is still new to getting in his but it is so much easier than going over his head. That looks like a great harness. That sounds like a great harness. It makes getting ready for our walks SOOOO much easier! Very stylish, Pierre! Nothing beats a step-in harness for ease of putting on. We prefer harnesses over collars for walking too, I can't stand it when they start hacking from pulling, that cannot be good for them. what a very cool harness. I love the idea of the step in harnesses. Some harnesses are so challenging to get on and off. Ruby needs a new harness as hers is getting pretty worn out. Maybe we will check this one out.